Specializing in Design, Manufacture and Installation of Ventilation Systems as well as general Sheet Metal Work, Stainless Steel, Aluminium and CNC Profiling. No job too big or small. Bespoke Ventilation Systems for new and refurbished buildings from the core of our business. We provide a complete service from initial consultation to installation and can design and manufacture special filters, chemical scrubbers, etc. to suit your special requirements. You will find our prices competitive, too. Apart from ducting and ventilation components, we can design and manufacture almost anything out of sheet metal. Our computer-controlled plasma cutter allows us to fabricate intricate components from most sheet materials including stainless steel, aluminium, PVC and polypropylene. We can supply a wide range of ventilation components and accessories from major manufacturers in the UK and beyond. Many items are available "off the shelf" and most of the others can be supplied within 24 hours. We also offer a "made to order" service to our customers. The design, manufacture and installation of acoustic room and enclosures is a growing part of our business. These enclosures are becoming increasingly common in factories and workshops which employ noisy machinery such as saws, planers and metal punchers. 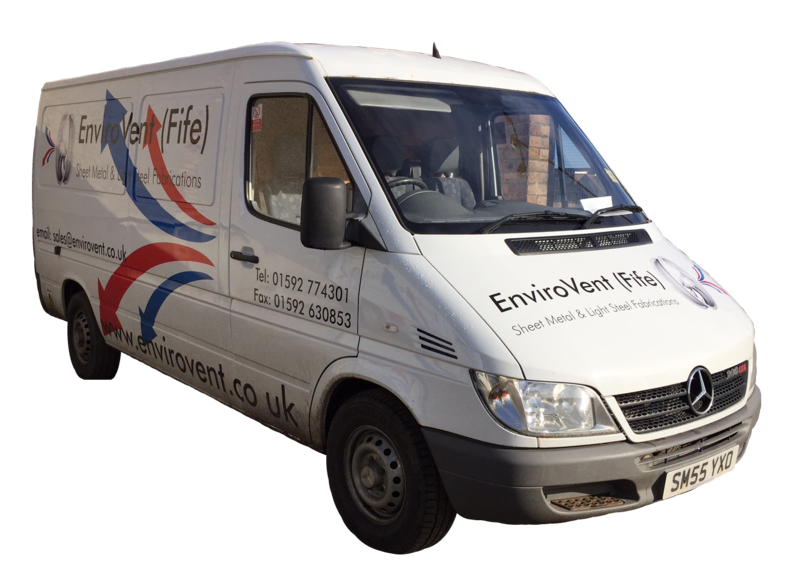 Established in 1989, Envirovent (Fife) is a small company that offers a personal service to industrial and commercial clients throughout Scotland. No job is too small and we oversee every one from start to finish. From design to CNC cutting to fabrication to installation, Envirovent (Fife) is the go-to place for all jobs regardless of size or complexity. To get excellent service for any job, big or small, just drop us a line with your requirements.